Can you believe that it is only Tuesday? The week after Spring Break is hard. Having a sweet taste of summer and then having to go back can be rough. Plus having parent-teacher conferences the week after Spring Break is just plain cruel. We have 7 weeks until "THE TEST", so we are beginning a little bit of Test Prep. Third grade is the first year for "the test" in NC so the sweet babies are usually terrified! I really love teaching the Question and Answer Relationship (QAR) strategy at the beginning of our Test Prep Unit! Do you use QARs in your class? It is a fabulous way to help students understand different types of questions. 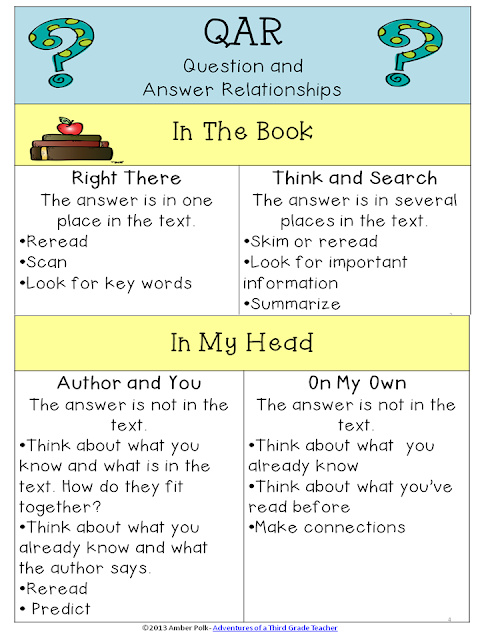 By seeing these relationships, students recognize that they can consider the question before developing an answer. Here's a little explanation of QAR's if you're curious! About half of the test questions tend to be "right there" questions, so I love showing the students if they will just take the time to look back and find an answer, they can pass that test easy peasy! I love hearing the students explain that the question is an "In The Book" question, so they just need to go back and find it in the text. It's always a big help to my struggling learners. I have a little something for you! 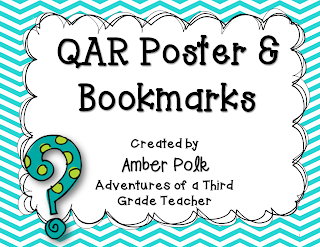 Click here or on the pictures to download the QAR Poster and student bookmarks at my TPT Store for free! I hope you can use them with your class. If you download them, I'd love if you left a little feedback. Thanks for sharing! I am not too familiar with QAR other than the few little things I've read on blogs. I've been wanting to try this strategy with my students and your blog/freebie has given me a great start. I am passing along a link to this post to my third grade pal! My second graders have just begun test prep for our state test and this will help so much! Your poster/bookmarks are clear and concise. Thanks so much for sharing! This is such a wonderful freebie!!! Thank you so much! Our test in in two weeks- ah!!! I wish I would have seen this sooner- I will for sure be using this at the beginning of the year next year! Thanks for posting. I am always looking for new comprehension strategies! This is quite different logic from other posts that i have read yet and i really like this very much. If we would follow these steps we will be able to do perfect best dissertation writing services uk and it will also improve our grammatical mistakes that we made very commonly many times. I encourage you for sharing this info with us that will definitely help us a lot. Thanks..!